LINES, VINES, AND JONAS TIMES: Girl Gives up Jonas Brothers for Lent . Girl Gives up Jonas Brothers for Lent . KEVIN & DANIELLE KISSING IN THE CAR! Joe Jonas: ' I LOVE YOU CAMILLA, MARRY ME' !!! JONAS BROTHERS 3D OUT TODAY ! MORE JONAS BROTHERS 3D TOUR INVASION LOCATIONS ! JONAS 3D IS BETTER THAN TWILIGHT ! Attention: LA JB fans ! Zac proposed to Vanessa ! Demi Lovato on New Moon soundtrack? JONAS BROTHERS 3D MOVIE SOUNDTRACK OUT TODAY ! JONAS BROTHERS SOLO PROJECTS ?! 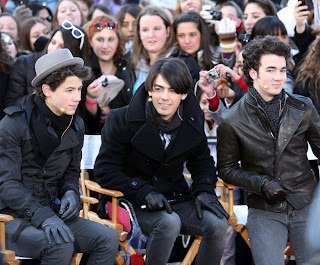 Jonas Brothers on "The Early Show"
JB on SNL last night ! JB on SNL tonight ! Nick Jonas is "single and ready to mingle"
Jonas Brothers 3D Concert Experience Update !